The ghosts of former tragedies were circling Liverpool Football Club last week, not as history lessons but as active agents in the volatile climate that spawned a fresh tragedy last Tuesday evening. Sean Cox from Dunboyne, Co Meath remains in a critical condition this weekend. Doctors at the Walton Centre, the city's specialist neurology hospital, are hoping to revive him from an induced coma over the coming days. Aged 53, a father-of-three, a stalwart of his community and the St Peter's GAA club, he is by all accounts a much-loved and respected man. Mr Cox's life has been changed by a random act of violence. Suddenly, out of nowhere, it intersected with a few strangers from a faraway city who knew nothing about him, nor he of they. The individuals happened for a moment to be sharing the same space outside of a public house in the shadow of Anfield stadium. And in that moment their paths fatefully crossed. In that moment these unknown young men inflicted an arbitrary act of malevolence upon him. He fell to the ground and his world collapsed. The world of his wife Martina has collapsed with him, and that of their children, and that of his brother who was with him, his extended family, his wider circle of colleagues and friends. The waves of anguish generated by this single, split-second violation have been deep and turbulent. It can only be fervently hoped that they will not ripple on forever; that Mr Cox will eventually be fully healed; that he and his family can become whole and happy again. Two Italians, Filippo Lombardi and Daniele Sciusco, have been charged with violent disorder. Lombardi has also been charged with wounding or inflicting grievous bodily harm on Mr Cox. They had travelled to support their team, AS Roma, in the Champions League semi-final, first leg. The second leg will take place next Wednesday in Rome. The assault on Mr Cox was the worst incident on a night of intermittent clashes. Fears have escalated that Tuesday's events will trigger further violence as an estimated 5,000 travelling fans converge on Rome in the coming days. Liverpool FC requested a meeting on Friday with senior police officers in Rome, along with officials from AS Roma and UEFA, to discuss a range of security measures. The club wanted clarity on issues ranging from the shuttle bus service taking their supporters to and from the Stadio Olimpico, the opening time at the turnstiles, security checks on bags, and the sale of alcohol. A Liverpool FC statement said they'd been seeking clarification on these and other matters "since the draw was made". In other words they were already nervous from the moment they were paired with AS Roma in the draw on April 13. Roma has a long history of fan violence. But in addition, of course, there was the bad blood between the two clubs that dated back to May 30, 1984. The Liverpool football team famously won the European Cup that night in the Stadio Olimpico after extra-time and penalties. 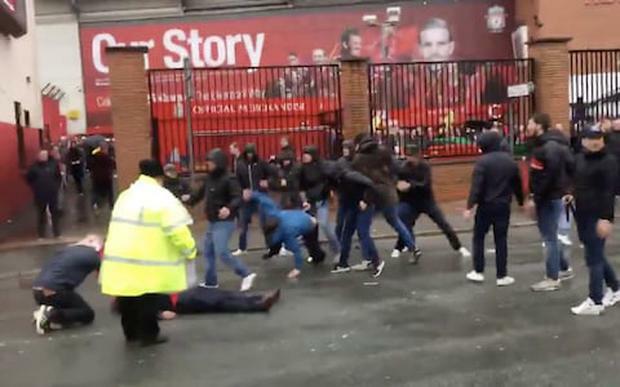 Dozens of Liverpool fans infamously took a beating afterwards from Roma's fanatics, the 'Ultras' or 'Tifosi'. An eyewitness account from that night is contained in a 2015 essay for the UK journal Sport in Society. Entitled 'Interwoven Tragedies: Hillsborough, Heysel and denial', it is written by the journalist and academic Rob Steen. He quotes a Liverpool fan, David Pye, who in 1984 was a mature student at the University of Brighton. "The Liverpool fans appeared to be set up by the police and Carabinieri [military police] in the immediate aftermath," recalled Pye, "being prevented from leaving the stadium until, it appeared, the Tifosi were ready for them. By now armed with baseball bats, clubs, chair legs, pool cues, chains and knives, a pitched battle ensued in the narrow streets of the ancient capital. Many English supporters and innocent tourists alike were trapped, beaten, brutalised and stabbed, for the most part in the buttocks - the ultimate slight, a trademark of Mussolini's Fascist vigilante mobs and Mafiosi enforcers." The argument has been made since by a range of interested parties, from journalists to Liverpool fans and historians of the game, that the attacks in '84 were a contributing factor in the tragedy at Heysel a year later. Not by any means the only factor, but one of them. In May '85 Liverpool faced another Italian team, Juventus, in another European Cup final. It wasn't about "revenge", Tony Evans tells Steen, "but the mood when we went to Brussels was 'That's not going to happen to us again'." Evans is a Liverpool supporter and the author of three books about the club. Thirty-nine people, mostly Italian, lost their lives at Heysel. Evans wrote a confessional piece on the 20th anniversary of the disaster. "A large proportion of Liverpool fans seemed to have lost control. We met a group of mates who had come by coach. A fellow passenger we all knew had leapt off as soon as they arrived and attacked two people, one an Italian, with an iron bar . . . The disaster has a long causal chain - stabbings and beatings in Rome, hair-trigger tempers, aggression on both sides, excessive drinking, poor policing and a stadium ripe for disaster." But Liverpool loyalists "who think it was nothing to do with us" are in denial. "It was. At least some of us." The average football hooligan doesn't need an excuse from history; alcohol and anger are usually enough. Most of Roma's and Liverpool's current crop weren't even born by 1984. But they've heard the stories; this fixture has summoned the ghosts; the violence then begets violence now. The cops and the clubs have a job of work to ensure no more families are shattered on Wednesday night.